The Aye-aye (Daubentonia madagascariensis) is a lemur and is native to Madagascar. It is the world’s largest nocturnal primate, and is characterized by its unusual method of finding food; it taps on trees to find grubs, then gnaws holes in the wood and inserts its narrow middle finger to pull the grubs out. 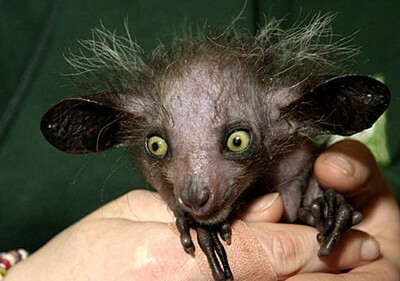 The monkey-like body of the Aye-aye enables it to move vertically with ease. It climbs trees by making successive vertical leaps, much like a squirrel. Horizontal movement is more difficult, but the Aye-aye rarely descends to jump to another tree, and can often cross up to 4 km a night. The Aye-aye commonly eats nuts, grubs, fruits, nectar, seeds, and fungi, classifying it as an omnivore. It often picks fruit off trees as it moves through the canopy, often barely stopping to do so. Aye-ayes tap on the trunks and branches of the trees they visit up to 8 times per second and listen to the echo produced to find hollow chambers inside. Once a chamber is found they chew a hole into the wood and get grubs out of that hole with their narrow and bony middle fingers. The babirusas are a genus, Babyrousa, in the pig family found specifically the Indonesian islands. They have also been referred to as the pig-deer. The babirusas are protected in Indonesia and poaching is illegal. Yet, a large percent of the inhabitants are Christians (in a country otherwise predominantly Muslim), and hunting and pork are major components of their diet and culture. 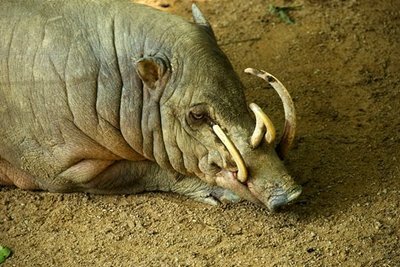 The babirusa is thus considered something of a delicacy. All extant species of babirusa are threatened by hunting and habitat destruction, resulting in them being listed as vulnerable or endangered by the IUCN. In the north Sulawesi babirusa, males ‘box’ much like rabbits or kangaroos during mating season. Females have a litter of one or two piglets, in a nest after 120-150 days. The Bald Uakari (Cacajao calvus) or Bald-headed Uakari is a small New World monkey with a very short tail, red face, a bald head, and long coat. It generally weighs less than 4 kg, and is anywhere from about 51 to 58 cm in length. Their scarlet red faces are due to the lack of skin pigments and plentiful capillaries that run under their facial tissue. This bright red facial skin is a sign of good health and allows for the determination of a healthy mate. Their powerful lower jaw forms a pseudodental comb, which allows the uakari to open the hard surfaces of unripe fruits and eat the nuts that most other primates would not be able to open. 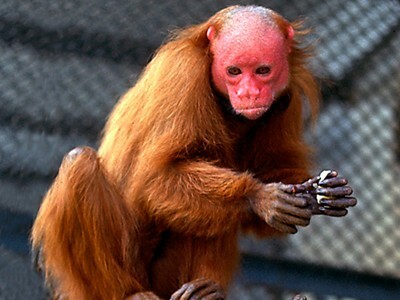 The uakari generally lives approximately 20 years. They prefer the seasonally flooded forests in the area of the Amazon River Basin, in the countries of Peru and Brazil. It is important that the uakari is arboreal (lives in the tree tops) because of the flooding of the forests and the water rising to great heights during the rainy season. During the dry season, they come to the ground to look for seeds and other food material. The Sphynx appears to be a hairless cat, but it is not truly hairless. The skin texture resembles that of Chamois leather. Because the sphynx cats have no pelt to keep them warm they huddle up against other animals and people. They even tend to cuddle up and sleep with their owners under the covers. Lack of a coat makes the cat quite warm to the touch. Whiskers and eyebrows may be present, either whole or broken, or may be totally absent. The skin is the colour that their fur would be, and all the usual cat marking patterns (solid, point, van, tabby, tortie, etc.) may be found on Sphynx skin. Sphynxes generally have wedge-shaped heads and sturdy, heavy bodies. Sphynxes are known for their extroverted behavior, displaying high levels of energy, intelligence, curiosity, and affection for their owners. While Sphynx cats lack a coat to shed or groom, they are not maintenance-free. Body oils, which would normally be absorbed by the hair, tend to build up on the skin. As a result, regular cleaning (usually in the form of bathing) is necessary; one bath a week is usually sufficient. 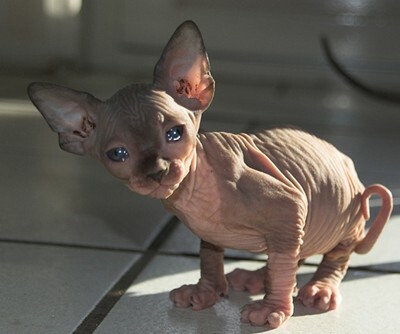 Care should be taken to limit the Sphynx cat’s exposure to outdoor sunlight at length, as they can develop sunburn and photo damage similar to that of humans. In general, Sphynx cats should never be allowed outdoors unattended, as they have limited means to conserve body heat when it is cold. The star-nosed mole (Condylura cristata) is a small mole found in wet low-lying areas of eastern Canada and the north-eastern United States. Star-nosed moles are easily identified by the eleven pairs of pink fleshy appendages ringing their snout which are used as a touch organ with more than 25,000 minute sensory receptors, known as Eimer’s organs, with which this hamster-sized mole feels its way around. The star-nosed mole is covered in thick blackish brown water-repellent fur and has large scaled feet and a long thick tail, which appears to function as a fat storage reserve for the spring breeding season. Adults are 15 to 20 cm in length, weigh about 55 g, and have 44 teeth. The mole’s most distinctive feature is a circle of 22 mobile, pink, fleshy tentacles at the end of the snout, from which they derive their name. These are used to identify food by touch, such as worms, insects and crustaceans. The extremely sensitive nasal tentacles are covered with minute touch receptors known as Eimer’s organs. The nose is approximately one centimeter in diameter with approximately 25,000 Eimer’s organs distributed on 22 appendages. A report in the journal Nature gives this animal the title of fastest-eating mammal, taking as short as 120 milliseconds to identify and consume individual food items. Its brain decides in the ultra short time of 8 ms if a prey is comestible or not. This speed is at the limit of the speed of neurons. These moles also possess the ability to smell underwater, accomplished by exhaling air bubbles onto objects or scent trails and then inhaling the bubbles to carry scents back through the nose. 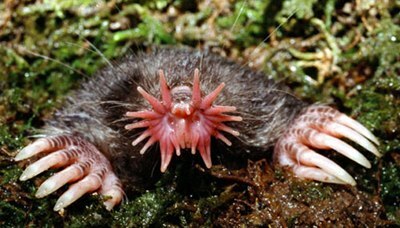 The star-nosed mole lives in wet lowland areas and eats small invertebrates, aquatic insects, worms and mollusks. It is a good swimmer and can forage along the bottoms of streams and ponds. Like other moles, this animal digs shallow surface tunnels for foraging; often, these tunnels exit underwater. It is active day and night and remains active in winter, when it has been observed tunneling through the snow and swimming in ice-covered streams. My son and I often have these sorts of arguments about who would win (in a fight) between a great white shark and a nile crocodile, or a polar bear and an african lion, or even between Iron Man and The Incredible Hulk. Naturally these are all purely hypothetical scenario’s, and all I can offer is a best guess – but which nevertheless fires off a healthy debate. However I can offer “precise” answers when he asks about who would win (in a race) between a cheetah and an ostrich, or a mako shark and a sailfish, or even a Bugatti Veyron and a Koenigsegg – so here they are. NOTE: these lists are not comprehensive – they only include those of interest to my son and I. * The peregrine falcon is by far the fastest of them all – but in its “power dive” when it has been recorded doing 347 kph. In level flight however it does not feature in this list.